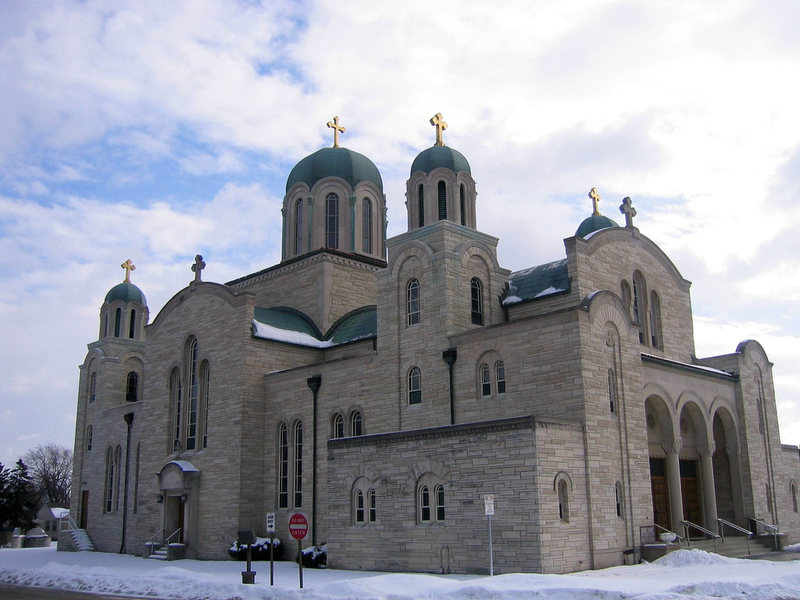 St. Sava Serbian Orthodox Cathedral, located on 51st Street just south of Oklahoma Avenue, is currently the main place of worship for Milwaukee’s Serbian Orthodox community. The congregation has its roots in an influx of Serbian immigrants to Milwaukee in the early twentieth century, a migration that called for the creation of a new church. 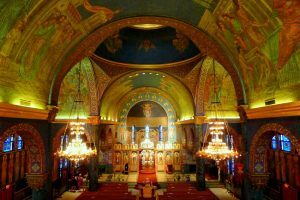 The Serbian Orthodox Church of Milwaukee was founded February 8, 1912 with its first center of worship at 724 S. 3rd Street. By the 1950s, continued growth of this congregation demanded plans for a larger center of worship. Designed by the architecture firms Lefebvre & Wiggins and Camburas & Theodore, the Cathedral was constructed in the traditional Byzantine style associated with Serbia’s churches. Construction began in October of 1956. The church, as well as the adjoining school and parish house, were officially completed on February 4, 1958. It was consecrated a few months later during the third annual Serbian Days celebration, August 30-31, 1958. The church’s five copper-clad domes, numerous curved arches, and its interior mosaics (imported from Italy) made the church a unique addition to Milwaukee’s religious landscape. Dedicated to St. Sava, patron saint of the Serbian people, the Cathedral has remained a center for the local Serbian community ever since.In early 1997 a new parochial school was opened at the Cathedral to provide an Orthodox Christian education to the congregation’s children, thereby bringing the Cathedral complex to its modern form. ^ Milwaukee Ethnic Church Guide: The Rich Heritage of Immigrant Architecture (Milwaukee: City of Milwaukee Department of City Development, June 1994), 25. ^ Milwaukee Ethnic Church Guide, 24. ^ “Church History,” St. Sava Serbian Orthodox Cathedral website, accessed September 1, 2017. ^ St. Sava Serbian Orthodox Cathedral website, accessed September 10, 2017. Milwaukee Ethnic Church Guide: The Rich Heritage of Immigrant Architecture. Milwaukee: City of Milwaukee Department of City Development, 1995. St. Sava Cathedral: 100 Years of Faith and Tradition. Milwaukee: St. Sava Serbian Orthodox Cathedral, 2012.